Susie is blind and deaf, but she loves the feeling of the wind in her face. That’s what owner Norma Miedema says, and that’s why her Susie’s best friend, a Rottie with wheels, carts her around. When you can’t hear or see, you tend to appreciate these little things even more. Susie might not be able to run around, but that won’t stop her from going on adventures! Her best friend doesn’t seem to mind being her personal chauffer – he’s just glad to be able to romp around, too! "Rottweiler breeders aim at a dog of abundant strength, black coated with clearly defined rich tan markings, whose powerful appearance does not lack nobility and which is exceptionally well suited to being a companion, service and working dog." This breed is all about balance, endurance, proportionality, intelligence and strength. 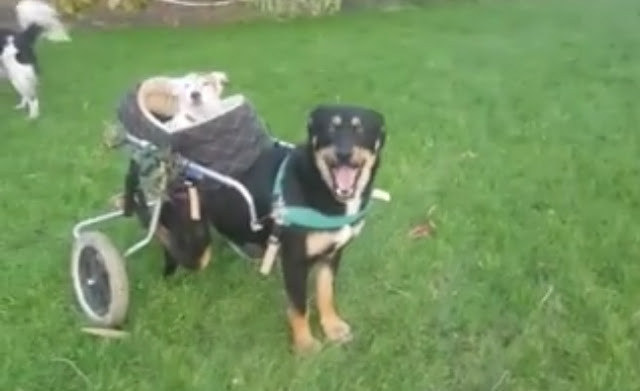 Responses to "Dog With Wheelchair Takes Blind, Deaf Best Friend for Rides"
How wonderfully awesome and beautiful. Such love by unconditional loving creatures. It was so touching to watch, I smiled all the way through it with my heart and my lips. Thank you for sharing.